The key to keeping your balance is knowing when you've lost it. Coaching can help you to look at the balance of all aspects in your life. Life can be hectic and often your attention and time becomes weighted in some areas more than others. When this happens, all focus is directed towards one aspect, other areas of your life will suffer. This off-balance can only last for so long before you begin to feel overwhelmed, stressed or dissatisfied. The key to a happier life is to find a balance that works for you and your family. Coaching can help evaluate the imbalance to enable you to make the changes required. 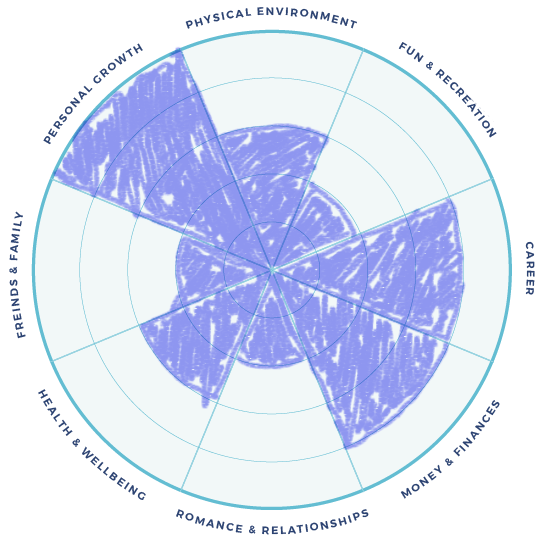 The Wheel of Life is one of the useful tools that is used in coaching to visually highlight the areas that you are satisfied with in your life and what areas you need to give more focus to. You can immediately can see why you have sought Life Coaching. Are you balancing your life the way you want to? Let us divide Life into the eight areas below…. If you were to take each segment, thinking about how your life is at the present time, and shade up to the number you feel relevant to your level of satisfaction; ’10’ being the highest. When completed, the ideal Wheel should be fairly circular in shape for a well balanced life. So any peaks and troughs, will show the areas that may need adjustment. It is good to note that by altering one area of your Life, you will notice that other areas will change too. For example If you were spending all your time on Fun & Recreation, you may notice that Finances or Career scored less than satisfactory for you. Any change will create a ‘knock on’ effect, reducing time spent out and about, could improve work time and your money situation. If you Work to excess then perhaps your Relationships are suffering because of this. A tweak in one direction could vastly improve another. When an area is identified that you wish to improve, Coaching will help you to put a plan in place to achieve this. Drop, in your name and email, download your Wheel of Life, fill it in and move forward. Being Hypnotised – How Does it Feel? Hypnotherapy – How it Works?